Our week in Austro-Hungary was a busy one. We started with three nights in Budapest at the Le Meridien, before jumping onto a train and zooming across the border into Austria, having two nights in Vienna, and then getting on the train again and coming back to Budapest for one more night. On our last night in Budapest we stayed at the Corinthia, and it made me realize just how much I had fallen in love with the Le Meridien earlier in the week. This is when I prove just how honest a blogger I am, and say that despite our stay at the Corinthia being a fully complimentary suite in return for a review (more on this next week), it wasn't my favourite. 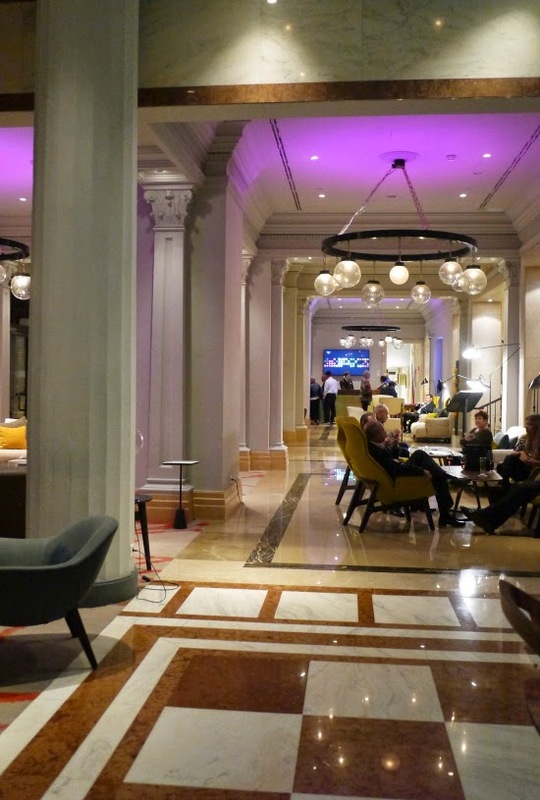 We paid for our stay at Le Meridien, but it was so much lovelier. The Corinthia was very big and beautiful but felt much more like a five star business hotel, aka, soulless, whereas Le Meridien had a heart and a very friendly feel to it. We had an incredible view over St Stephen's Basilica. We were welcomed late in the evening with a bottle of the local Hungaria sparkling wine in the room, and we quickly drank it before getting all dressed up and going downstairs for drinks in the bar. We'd been eating all day; breakfast at Heathrow airport (is it just me who loves breakfast at airports?! ), lunch at Schipol airport, and then dinner (best, sandwiches, ever) on our KLM flight, we were so full up we didn't want any more food, so to the bar it was! 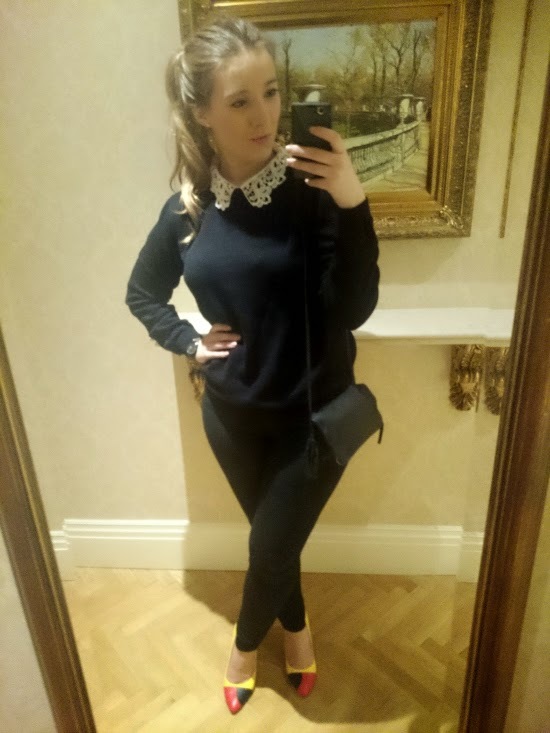 I wore: Primarni Jumper, standard black jeans, Yull Cornbury Shoes, Iris Boutique bag. 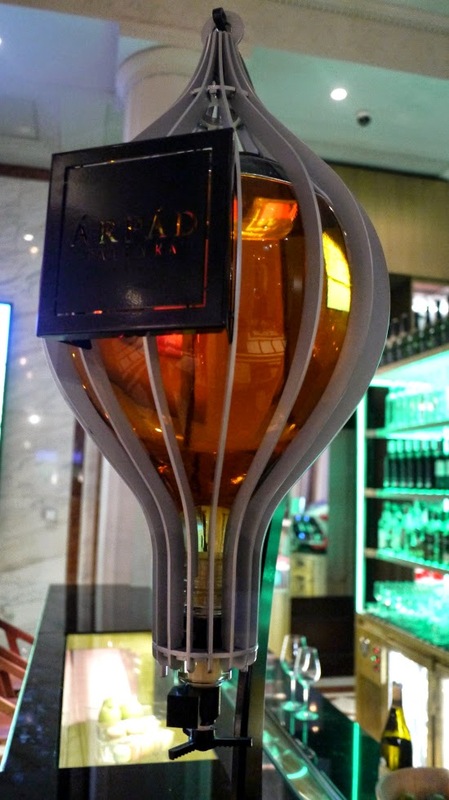 The bar is just like the rest of the hotel, modern and glamorous, with little touches of traditional. We opted for cocktails. It was our first night and they were similar prices to back home in London, little did we know at this point that cocktails in Budapest usually cost around £3! We soon found out...and we didn't look back. 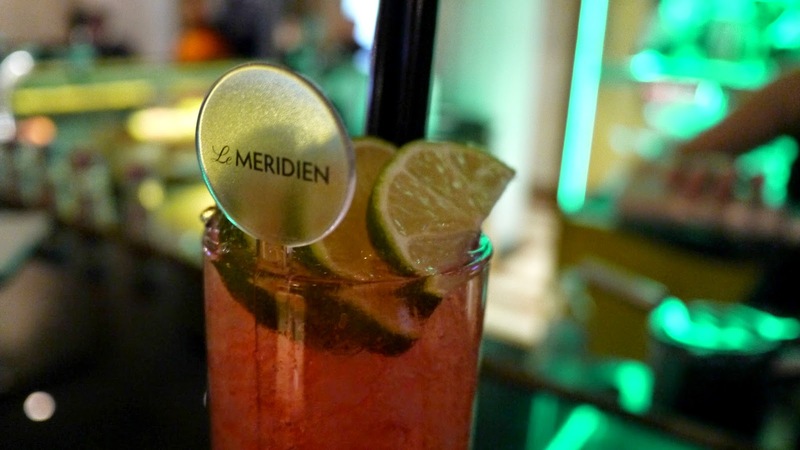 Anyway, the cocktails at Le Meridien were very good, and very strong. The bar was buzzing with hotel guests, the majority middle-aged Americans with some other younger people dotted around. 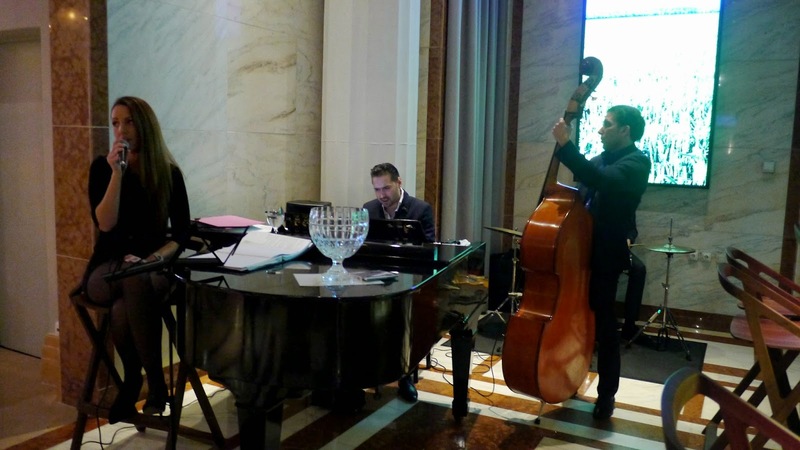 A band played ballads and jazz music, while the bartenders mixed up cocktails and two huge glass globes held different flavours of Hungarian Palinka, which is a type of fruit brandy. The swimming pool at Le Meridien was small and perfect for a quick dip, but the jacuzzi was amazing! On the Tuesday evening we had an early start the next morning, so had a long lounge about in the jacuzzi before going for an early dinner. It was so so quiet, no one else was in there! There's also a gym which looked like it had plenty of equipment in it, and a sauna and steam room. It was the breakfast buffet at Le Meridien that really impressed us though; a huge spread of fruits, yoghurts, cereals, pastries and croissants, fresh breads with hams and cheeses, and a full cooked breakfast complete with Veal sausages! They even had waffles with maple syrup and loads of different types of fruit compotes to put on top! The restaurant where you have the breakfast, is in a huge bright atrium flooded with natural light. The atmosphere is bright and cheery with families and elderly couples alike filling up for the day on the delicious food. 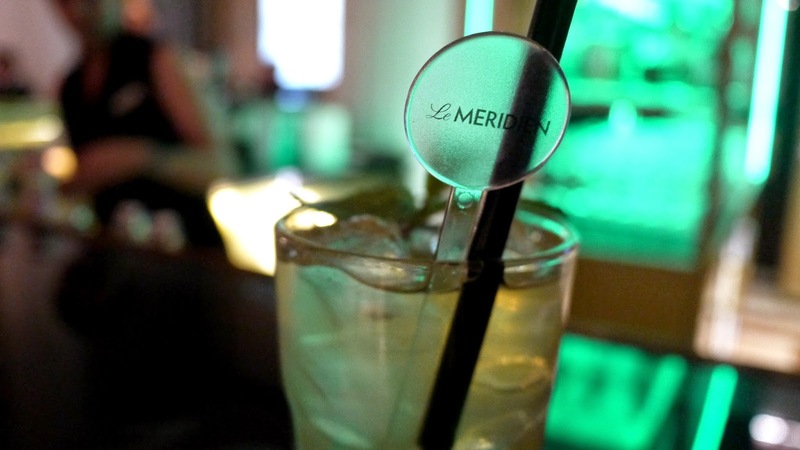 We had a really wonderful and memorable stay at Le Meridien Budapest, everything about our stay was just fabulous. Before going I had a read of the TripAdvisor reviews, and all of them were glowing - I can now see why! And it wasn't just little old us staying there, there was a huge group of Kazakhstan politicians staying there too! Oh la la! If you're looking for a decent hotel in Budapest, definitely book a stay at Le Meridien, you will not be disappointed. Also, check out the views from our room! This is the hotel i stayed in for my Honeymoon!!! So many memories! I love Budapest. I stayed here years ago - it is amazing!